Onions are one of the most commonly grown and consumed vegetables in the world. 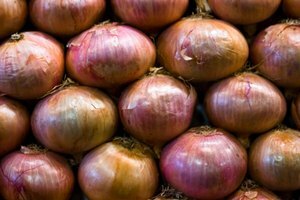 According to website Onions USA, the average human being consumes approximately 13.67 pounds of onions each year. 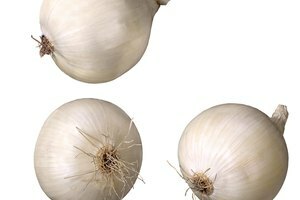 Onions can be dried for storage purposes and later cooked into any recipe that calls for fresh onions. 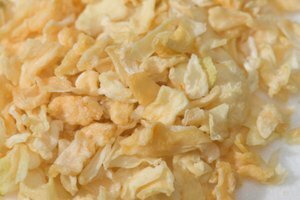 You can also purchase dried onion since certain recipes call for it specifically. Some of the most common uses for dried onion include recipes for soups, sauces, beans and casseroles. Learn the conversions. According to Alice Henneman, an extension educator at the University of Nebraska, a 1/4 cup of chopped, fresh onion is equivalent to one tablespoon of dried minced onion. Keeping this in mind, you can substitute dried onion for fresh onion in any recipe once it has been re-hydrated. Since so many dishes call for onion as part of the recipe, it is a good idea to keep a small bottle of dried minced onion in the pantry in case you run out of fresh ones while cooking. Rehydrate the dried onion. Soak the dried onions in warm water for about 20 minutes before using them in a dish that does not involve much moisture. According to food blog Culinary Cafe, you can skip this step if you are making a soup, sauce or stew as the onion will rehydrate while it it cooking. The warm water should measure out to be at least the same amount as the amount of dried onion you have measured. For example, if you are soaking 1/4 cup of dried, mined onion, you need to use at least 1/4 cup of warm water to soak it. You can use more water than this, but not less. Once the dried onions have absorbed the warm water, drain the excess water before adding to meats, casseroles or anything else you have decided to make. 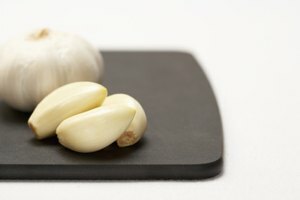 If you are using the dried onion without re-hydrating it, you can add it to the stew, sauce or soup just the way it is. 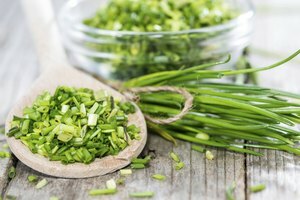 Some recipes call for dried onion to be used without re-hydrating them since they release their flavor faster than fresh onions, explains Culinary Cafe.